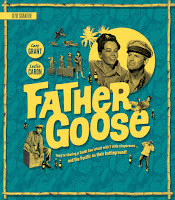 Cary Grant stars in the WWII comedy FATHER GOOSE (1964), recently released as an Olive Signature Blu-ray by Olive Films. As I mentioned in my review of Grant's OPERATION PETTICOAT (1959), which is also a new Olive Signature Blu-ray, the Olive Signature releases are now Blu-ray-only limited editions, with just 3500 copies produced of each disc. 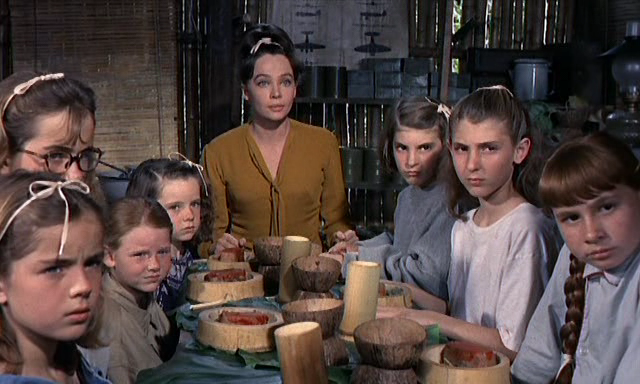 FATHER GOOSE was Grant's penultimate film, followed only by WALK DON'T RUN (1966). It's a bit of an oddball movie in some ways: for one thing Grant plays a scruffy, ostensibly lazy hard drinker, and for another, the film mixes cute family romantic comedy with very real wartime terror. Somehow, though, it all works; part of that is due to the trust the audience has in Grant, regardless of his character's flaws, and Trevor Howard is also a key ingredient as he bemusedly reacts to the goings-on along with the audience. 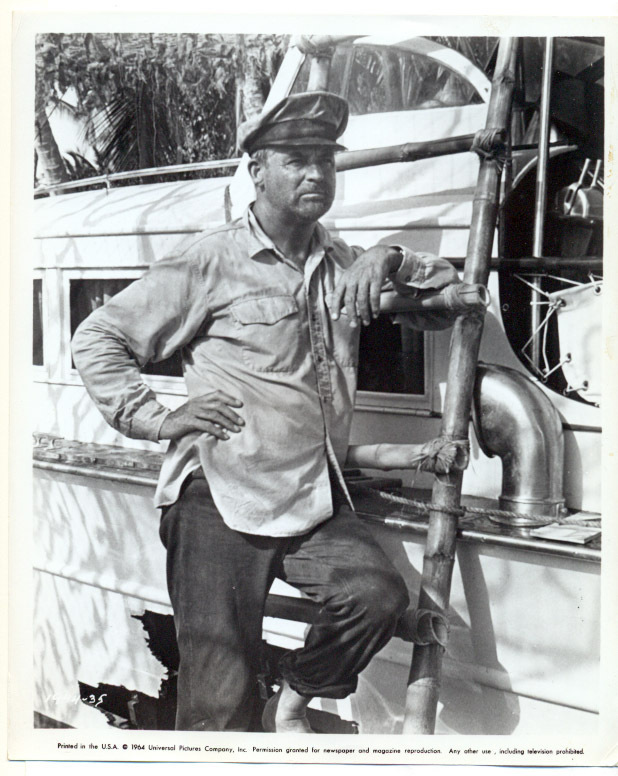 Grant plays Walter Eckland, who lives on a small boat in the South Pacific. 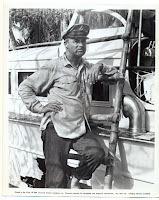 He's pushed -- some might say blackmailed -- by the British naval officer played by Howard into serving as a lookout on an uninhabited island. With his boat out of commission, Walter is sent in his dinghy to rescue the lookout on another island, with the promise the man will replace him, but when he arrives he learns his counterpart is dead. Instead he finds a stranded French schoolteacher, Catherine (Leslie Caron), who is caring for seven young girls, the children of diplomats. They embark on a precarious journey back to Walter's island in his overcrowded boat, then after arriving proceed to drive him crazy as they clean up Walter's home and, ultimately, Walter. Meanwhile there is constant danger, with Japanese patrols approaching the island by sea and by plane. And there's danger of a different kind entirely as Walter and Catherine let up on their bickering and begin to have feelings of a different sort for one another. With anyone else in the lead the movie might not have worked, though I could perhaps imagine Robert Mitchum in the role. Because Walter is Cary Grant, we never get too worried about his drinking -- after all, for one thing, we never really see him drunk! And when he gets serious it's clear there's an entirely different kind of man underneath the loud-mouthed exterior we meet in the early scenes; indeed, time and again we see that under the unkempt, grouchy exterior Walter is brave and resourceful. Grant walks a fine line and does it well, utterly hilarious at times and deadly serious in others. Caron's spirited if straight-laced schoolteacher is a perfect foil. She looks delicate yet has the toughness needed to corral seven fractious, frightened children and simultaneously put Walter to rights, all while knowing the Japanese could invade at any moment. The age gap between Grant and Caron somehow doesn't seem quite as significant as it might, and in a way it also works as part of the story, as the two leads increasingly fight an unspoken attraction to one another. I've never had a problem believing these two charming people would have a romance. Some modern viewers might be uncomfortable with the characters slapping one another around, but it's ultimately played for humor, preceding a grand romantic gesture. Like the drinking, I just don't take it seriously. Howard is simply great, and like Grant he has the ability to go from playing comedy to deadly serious reactions to information he receives from Walter. The climactic radio scene with the entire cast is a delight. This was the only film for most of the seven girls in the cast, which included two sets of real-life sisters. They all do a fine job. 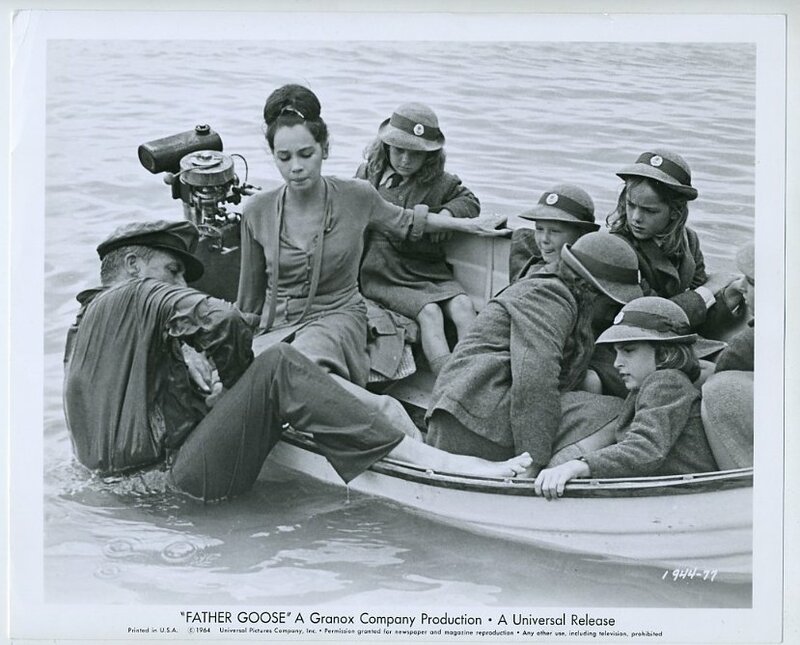 FATHER GOOSE was directed by Ralph Nelson and filmed by Charles Lang, with exteriors filmed on location in Jamaica. The Olive Signature Blu-ray has several extras including a commentary track, featurettes, newsreel footage, and an essay, which is also provided in an attractive booklet in the Blu-ray case. 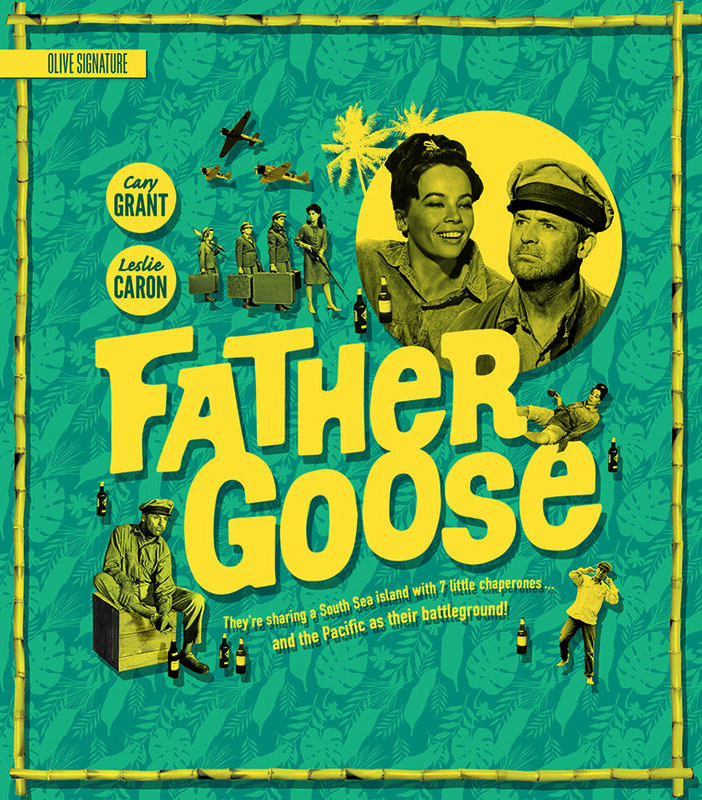 FATHER GOOSE may not be one of the topmost films in the Cary Grant filmography, but it's a very good one I've loved for most of my life, and it's also a great way to introduce younger viewers to Cary Grant. For Grant fans this new edition is a must-buy. Thanks to Olive Films for providing a review copy of this Blu-ray. This whole set-up with the restoration and extras sounds marvelous. 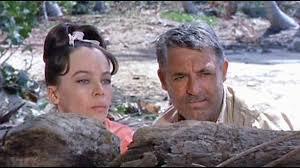 Father Goose was my introduction to Cary Grant, at the movies as a very little kid. I thought he was adorable and funny. That certainly hasn't changed through the years. that needed to be two hours long. John, I hope you enjoy returning to it. They pack quite a bit of story in -- and it's kind of interesting, the opening showing how Walter ended up on the island didn't seem familiar to me. As I alluded to in my review, I suspect that part wasn't shown when it was hacked up for local TV airings in the '70s!